Our multi-award winning Hostel is a traveller’s home away from home. Run by travellers for travellers and voted Best Hostel in Georgia two years in a row we provide a cheap, fun, centrally located, clean and comfortable base to explore Tbilisi and the surroundings, as well as to socialise with other like-minded people. Our staff are friendly, knowledgeable and here 24 hours a day ready to make your stay in Georgia a wonderful experience. Located near to the Opera house on Tbilisi’s main street Rustaveli Avenue, not only is the old town and the cities sights right around the corner, but we are only a 3 minute walk from the metro, airport bus and other city transportation as well as supermarkets and great local restaurants. 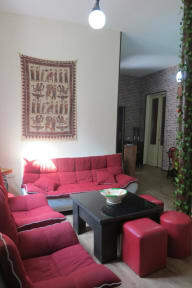 The hostel is in a historical building looking out over a peaceful traditional inner courtyard. We have a 24 hour reception so rest assured we are always there for you if you need us. There are two dorm rooms, each bed with a comfortable mattress, locker and wall socket and we also have two comfortable private rooms perfect for those wanting some more privacy. The hostel has two separate bathrooms each containing an excellent hot shower and toilet, so no queuing!! Everything has been completely renovated and is new and clean. The kitchen is fully equipped with everything you will need for your stay, free tea and coffee, beer for sale and we have a washing machine for your use. Our communal area features relaxing sofas plus optic internet and Wi-Fi covering every room. A fresh tasty breakfast is also included in the price. The hostel has a relaxed feel and tries to maintain a communal atmosphere for travellers to relax, share stories and enjoy their stay in Tbilisi. We have a wealth of experience both for Georgia, Iran and other surrounding countries regarding Visas, transport and other issues and it would be our pleasure to help you plan your travels both here and elsewhere. Very nice staff. The atmosphere is grest and we felt very welcome there. The hostel is nice and cosy. The hostel owner and the staff are really helpful with all questions of us and always open for a good talk. Incredible hostel!!! I checked out 3 places in Tbilisi and this was by far the best one! The staff is simply amazing, very friendly and easy to talk to. As a solo-traveler you are meeting a lot of people in the cozy common area and sure enough the entire place is perfectly clean. Stop reading reviews and book your stay right now! I enjoyed my stay at Marco Polo Hostel very much. The atmosphere is very homely and welcoming and the hosts are great. They provide you with a lot of tips and help in every way they can if you need it. The location is perfect, directly at the main road. I would stay there again every time! This hostel was absolutely lovely! A great location in the middle of the main street (despite the busy street it's very quiet in the hostel itself), main Tbilisi attraction are within walking distance. The staff and owners are incredibly friendly and helpful. They provided us with great recommendations and created a cosy atmosphere in the hostel. The hostel and the facilities have been the cleanest ones we've seen in Georgia. Delicious free breakfast! :) Definitely recommended. Ein wirklich gutes Hostel. Hat alles was man braucht, ist sauber, ruhig und gut gelegen. Die Mitarbeiter sind selbst reisebegeisterte Leute, die sich gut um ihre Gäste kümmern. Haben von den beiden viele gute Tipps bekommen und uns lange mit ihnen unterhalten. One of my all time favourite hostels. Nothing to complain about. Would defenitly recomend it!